Images from telescopes onboard STEREO spacecraft showing a coronal mass ejection event on December 12-13, 2008. Data from both spacecraft are shown simultaneously. NASA's twinSTEREO spacecraft have provided scientists with their first view of the speed,trajectory and three-dimensional shape of powerful explosions from the surfaceof the sun. Thisknowledge could help scientists better understand the inner workings of thesesolar tsunamis, known as coronal mass ejections (CMEs), and how and when they couldaffect Earth. 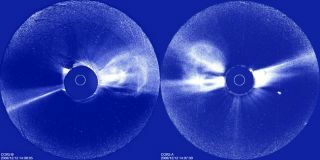 "Weare able to obtain the three-dimensional structure of the CME for the firsttime," said Angelos Vourlidas, project scientist for the Sun EarthConnection Coronal and Heliospheric Investigation, of the Naval ResearchLaboratory in Washington, D.C.
Onefamiliar phenomenon that results when a CME collides with Earth's magnetosphereare the beautifullycolored auroras, more commonly called Northern or Southern Lights. Whilethese light shows in the sky are harmless, CMEs can produce a form of solarcosmic rays that can be hazardous to spacecraft, astronauts in space andtechnology on Earth. Such spaceweather produces disturbances in electromagnetic fields on Earth that caninduce extreme currents in wires, disrupting power lines and causingwide-spread blackouts. These sun storms can interfere with communicationsbetween ground controllers and satellites and with airplane pilots flying nearEarth's poles. Radio noise from the storm also can disrupt cell phone service. "Ifthey hit Earth it can actually cause all sorts of electricalconsequences," said STEREO project scientist Michael Kaiser of NASA?sGoddard Space Flight Center in Greenbelt, Md. Coronalmass ejections carry billions of tons of plasma into space at thousands ofmiles per hour. This plasma, which carries with it some of the magnetic fieldfrom the corona, can create a large, moving disturbance in space that producesa shock wave. The wave can accelerate some of the surrounding particles to highenergies that can produce a form of solar cosmic rays. Thisprocess also create the disruptive spaceweather that can happen during and following the CME's interaction withEarth's magnetosphere and upper atmosphere. NASA'sSolar Terrestrial Relations Observatory, or STEREO,spacecraft have a unique view of CMEs because are stationed at differentvantage points. One leads Earth in its orbit around the sun, while the othertrails the planet. Thespacecraft can make simultaneous observations of these ejections of plasma andmagnetic energy that originate from the sun's outer atmosphere, or corona,which enables researchers to triangulate the trajectory of the CMEs. The uniquepositioning of the spacecraft combined with their monitoring abilities"really gives us insight here that we have not had before," saidAntoinette Galvin, principal investigator, Plasma and Suprathermal IonComposition instrument, from the University of New Hampshire in Durham,likening their measurements to those made of more decidedly Earth-bound storms:"They're like those aircraft that go into the eye of the hurricane." Usingthree-dimensional observations, solar physicists can examine a CME's structure,velocity, mass, and direction in the corona while tracking it throughinterplanetary space. These measurements can help determine when a CME willreach Earth and predict how much energy it will deliver to our magnetosphere,which is Earth's protective magnetic shield. "Beforethis unique mission, measurements and the subsequent data of a CME observednear the sun had to wait until the ejections arrived at Earth three to sevendays later," Vourlidas said. "Now we can see a CME from the time itleaves the solar surface until it reaches Earth, and we can reconstruct theevent in 3-D directly from the images." STEREO hastaken such measurements for 40 CMEs, "and we can do it for pretty much anyCME that the sun is going to throw at us," Vourlidas said.